This highly acclaimed restaurant is now looking for a new and ambitious Head Chef to take the reigns and drive the business on where the food is 100% cooked from fresh – nothing is centrally produced! Looking to take on a Head Chef to be involved in all aspects of this new opening. 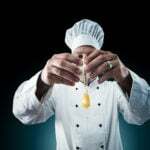 It is both modern and contemporary but also based strongly on worldwide influences and looking for chefs from modern quality backgrounds. To be considered for this Head Chef in Leeds City Centre – please send your cv to Paul at The Recruitment Room – paul @ therecruitmentroom.co.uk to arrange immediate working interview. All candidates must be eligible to live and work here in the UK. Time for a Career Reboot? Hungry for a new job in 2019? Come on England! You can do this! Another Sunshiny Bank Holiday Weekend! 2018 – It’s going to be a great year ahead! We still have Jobs to Fill before Christmas! Daring new job from The Recruitment Room this Halloween! Activate your Autumn with a new Job! To receive emails from us and keep up to date with the latest jobs and industry news, please complete the short form below. We will never share your email with any third parties. 2.1 Our Web site does not enable our visitors to communicate with other visitors or to post information to be accessed by others. 2.2 Our Web site does not include links to third party Web service providers. 3.1 We do not automatically log personal data. 3.2 We do not link information automatically logged by other means with personal data about specific individuals. 4.1 We do not collect any personal data from our visitors when they use our services. 4.3 We do not collect or use personal data for any purpose other than that indicated in the table below. 5.1 We do not knowingly collect personal data from children. 5.2 We do not take specific steps to protect the privacy of children who disclose their personal data to us. 5.3 We do not provide information about our personal data practices in relation to children on our homepage, or at those sites on our Web site where we collect personal data. 7.1 We do not give visitors to our Web site the option of using a secure transmission method to send us their personal data. 7.3 All our employees and data processors, who have access to, and are associated with the processing of personal data, are obliged to respect the confidentiality of our visitors\’ personal data. 7.4 We ensure that your personal data will not be disclosed to State institutions and authorities except if required by law or other statutory regulation. 8.1 There are no national laws or self-regulatory schemes applicable to our web site or organisation. 8.2 There are no global or regional regulatory or self-regulatory schemes applicable to our web site or organisation. 9.2 We do not provide any other means by which visitors’ concerns may be addressed.